This month on The Writer and the Critic, Kirstyn McDermott and Ian Mond spend some time discussing the results of the recently announced Aurealis Awards. Ian valiantly attempts to pry a little out-of-school talk from Kirstyn, who convened the Horror judging panel, but Kirstyn just as valiantly resists the spilling of any beans. Well, mostly. You know how persistent Mondy can be. And from the Department of Filthy Lucre, Kirstyn and Ian are pleased to announce the opening of a brand spanking new Writer and Critic Zazzle Store from which their loyal listeners can purchase all kinds of yummy merch! Okay, there's just one design available right now, but it's very classy. Inspired by last episode's conversation about stick figures, which was in turn inspired by listener feedback from Mark Webb, Kirstyn has designed a female stick figure logo which is now splashed across shirts, badges, stickers, mugs and a whole heap of other swag. 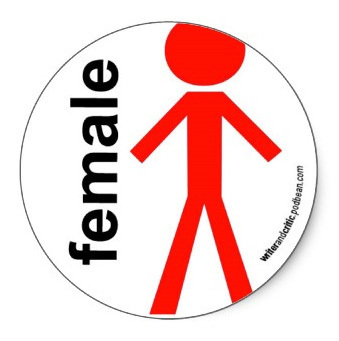 Why is the stick figure female? The more important question is, why is it male? Go on, you know you want one. 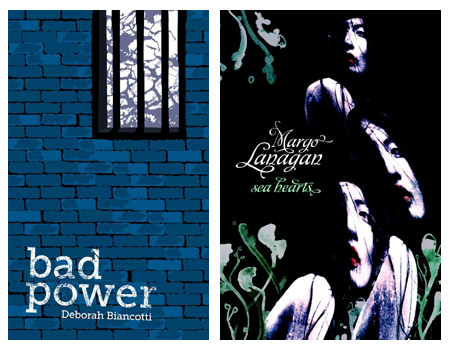 Around the 26:20 mark, discussion turns to the first of the two books for the podcast, Bad Power by Deborah Biancotti, which Ian recommended. Ishtar, an anthology from Gilgamesh Press which includes a novella by Deb, is tangentially mentioned and garners a bonus mini-review from Kirstyn. At 45:00 they switch over to Sea Hearts by Margo Lanagan (also known as The Brides of Rollrock Island outside of Australia), which was Kirstyn's pick. Ian mentions this review of the book by Abigail Nussbaum and, for listeners wanting to know more about the writing of the novel, Kirstyn suggests watching this interview with Margo. Sea Hearts was expanded from a highly acclaimed novella of the same name, which can be found in the X6 anthology from Coeur de Lion Publishing. If you've skipped ahead to avoid spoilers, please check back in at 1:25:10 for final remarks and some exciting -- and exhausting! -- announcements about future episodes. Kirstyn and Ian would also like to thank the wonderful Charles Tan for creating a Pinterest board of all the books they have review on the podcast so far. There's really quite a lot of them! Next month, The Writer and the Critic hits the road once more to record its second live podcast in front of an audience at the Continuum 8: the National Science Fiction convention in Melbourne. Their very, very special guests will be Alison Goodman and Kelly Link, who have recommended The Crystal Singer by Anne McCaffrey and The Scorpio Races by Maggie Stiefvater respectively. (Ian and Kirstyn have wisely decided not to choose books of their own because, well, four people talking about four books in less than two hours would be a frantic kind of madness.) Read ahead and join in the fun!